David, accepting the point about the mechanism by which banks make loans via deposit liabilities---and that net withdrawals are the manner by which currency enters circulation---does not preclude inflationary pressures from increased bank lending from excess reserves, as you allude to at the end of your post. One could construct a model where inflationary expectations depend on the velocity of the money base, rather than M1; in either case, it is not so much the amount of cash in circulation (or excess reserves) that matters, but the speed with which money is exchanged that matters for expectations. I do agree that we do not fully understand the different channels for inflationary expectations formation, however, and it is both a theoretical and empirical challenge that remains. Jamus: "one could construct such a model..." I'd like to see it! As would I. But I wasn't trying to be facetious here; the point was that if one were to construct a model, it would be possible to incorporate an explicit role for excess reserves by making *velocity*, rather than either the level of M1 or the MB, the channel by which money affects inflationary expectations. If this were the case, then the distinction between the two would be less critical. You may well disagree that velocity is relevant for inflationary expectations. But the point I was trying to make was whether the original claim that you took issue with could be rationalized within a model (which I think it can). "The primary difference between the accounting principles and practices in the Financial Accounting Manual and GAAP is the presentation of all System Open Market Account securities holdings at amortized cost rather than the fair value presentation required by GAAP." "excess reserves are not inflationary" -- is that a theorem? I tried to sketch out a mechanism where excess reserves may be inflationary (I am skeptical of the argument, but I'm not sure we can dismiss it as a logical impossibility). Yes, I know that the Fed does not mark-to-market its assets, but why is this relevant? I would not aspire to something as ideal as a theorem. Certainly not before clearing some of the more practical aspects which reading your article leave me confused. What does exactly mean that “people know that the Fed does not have the tools to buy back all of its reserve liabilities.” That the Fed is unable to exchange a liability (reserves) for another (cash)? It makes no sense to me. Reserves are there for ensuring the smooth functioning of the payment system. People want more cash? The Fed (or via fed funds borrowing) will supply more reserves to any bank that could have a shortfall of them. Overall your inflationary story hinges on the asset value of the Fed’s balance sheet as a constraint to the ability of the Fed to conduct monetary policy. But how could this be of any importance? I fail to see how a 50% paper loss in Treasury bonds (or of any other size) is relevant for forming inflationary expectations or limiting policy making, and your blog does not go anywhere in explaining this. And as I said in my previous post “as an aside”, they won’t even be shown it in their books (no MTM). For me the key point is that reserves and inflationary expectation have little to do with each other. Bank lending may (or not) be inflationary but credit is not reserved constrained. I can’t resist saying this but I never attended a bank credit committee where I heard “sorry we don’t have bank reserves we can’t lend”. Lending is capital constrained so you may have as many reserves as you want but credit will still be limited by the banks’ capital base, and without credit I fail to see the inflationary risk. What if you think about it in purely fiscal terms? 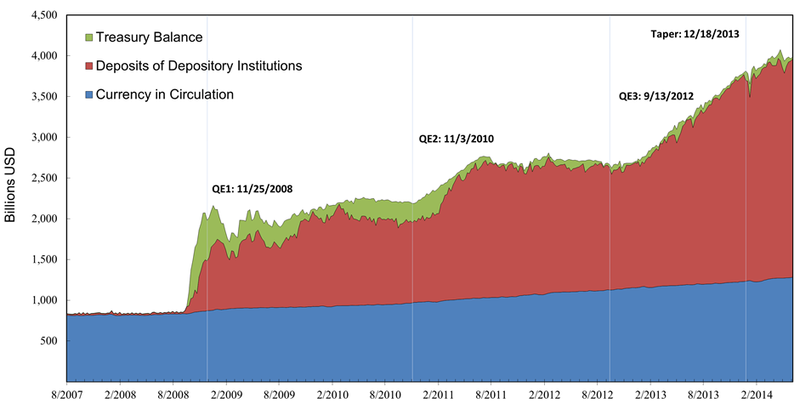 There is a combined Fed and Treasury balance sheet. This consolidated entity has dramatically reduced the duration of liabilities during QE. As a result, the taxpayer has absorbed much of the duration risk in the economy. All else equal, he is worse off and would like to return to his initial level of duration risk. This requires reducing the duration of assets (increasing the tenor of liabilities is harder for various reasons). 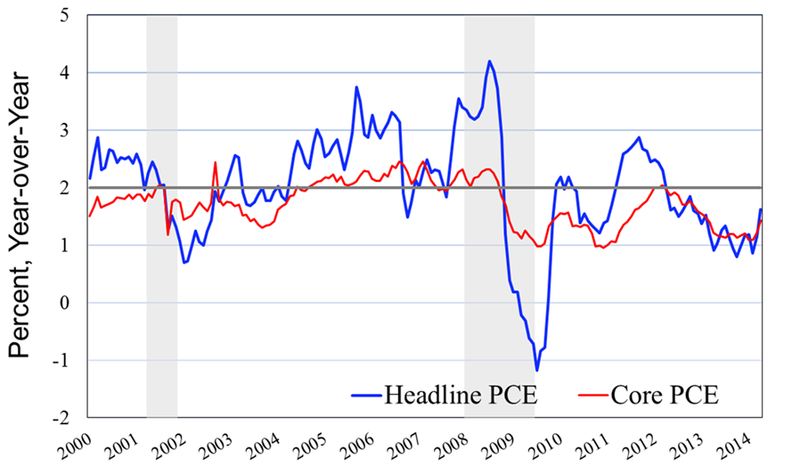 Okay, so inflation starts rising, and the Fed is behind the curve. That is, the Fed increases rates, but real rates remain negative, which implies, at some point, the Fed must increase rates more. At each step in this process, the taxpayer must reduce the duration of assets in expectation of further losses. Each time he does, it puts upward pressure on prices, drives inflation up, real rates down, and puts the Fed behind the curve even more. How does duration-shortening create inflation? Imagine households want to convert all long-duration fixed income bonds into short-duration goods inventories. Of course, they cannot necessarily accomplish this, but in trying, they drive up prices. Hmm...maybe. Do you have a model you can point me to, Diego? I'm trying to ask a question: what is the effect of the fiscal authority massively increasing duration risk? The obvious answer is, "taxpayers will offset this by reducing theirs". The follow on question is, "what is the effect of taxpayers attempting to reduce duration risk"? What I wonder is, is there a way to answer the two questions without getting to higher inflation? Assuming, of course, that the level of duration losses are material. This is where high deficits/debt come in. One thing that may not be apparent there in the price level model is the effect of the (I think generally slowly) varying kappa (he uses the Greek character rather than spelling it out). When kappa = 1/2, his equation reduces to the QTM. When kappa = 1, then dP/dM = 0. Jason has plotted data from a lot of different countries at different time periods (different decades). Some countries appear to be in the region where kappa is close to 1 (US, Japan, Switzerland), while others have a kappa closer to 1/2 (Canada, Sweden). The US in the 1970s I think had kappa closer to 1/2. 1/2 and 1 are not true limits, but he often regards them as being practical lower and upper bounds. One thing he may not point out in that particular post is how his P equation came about from the solution of a differential equation (DE), and how that DE in turn came about from an information theoretic view of money being used to transfer information from demand to supply. He's got posts on those basic concepts (check the right hand column). In that last one (on hyperinflation) he writes "MB" and "monetary base" but I think he actually means the currency component of the monetary base. He's more careful about avoiding this kind of confusion in more recent posts. In another post he also explains that he needed a way to quantify "M" (the money supply), and the currency component of the monetary base (which he sometimes writes as "M0" in later posts), happened to provide the best empirical fit out of the candidates he considered (I'm pretty sure MB was also a candidate). I don't know if he has a thorough theoretical explanation for why "M0" (I put it in quotes, because there is no official M0 in the US) is better for this purpose than MB, but I'm pretty sure he's at least floated a brief hypothesis on that somewhere in his blog. Thank you, Tom ... will take a look now. Hey, I think this guy is confused. Excess reserves DO get lent out and in the process get converted to required reserves through deposit expansion for the whole banking system. TOTAL reserves do not change but by converting them to required reserves a much larger stock of demand deposits can be supported, which in turn expands M1 (which is what people worry about regarding inflation – not M0). 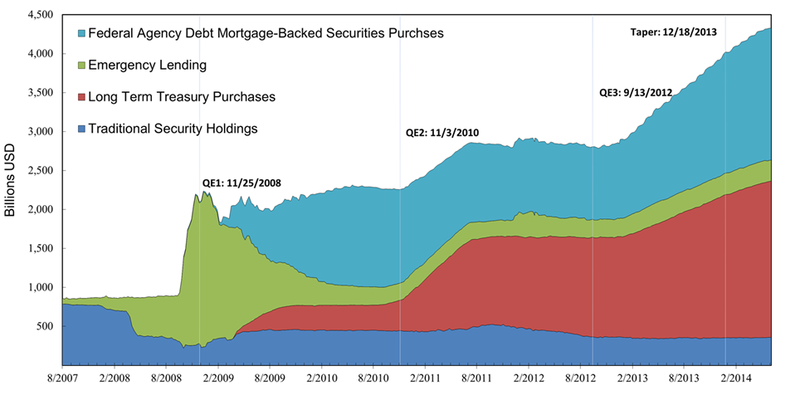 The potential expansion of M1 from “lending out excess reserves” is what people are concerned about causing inflation. So Paul seems to be confusing total and excess reserves in parts of his analysis. That is why he keeps saying reserves can only go down if there is currency redemption – not through bank lending. This is fine as long as one clarifies that it is total reserves that can’t be lent out. But excess reserves can go down while total reserves stay constant – required reserves just go up. I'll have to think about this a bit more. But one thing comes to mind. I understand that people may be concerned that an expansion in M1 is inflationary. But the models I write down do not necessarily support this. I like to think of the private money created as "fully-backed" currency. If banks are financing positive NPV projects, the expansion in private money should not be inflationary. Indeed, I'm not even sure it is inflationary if the projects are losers (as long as banks have enough equity to absorb any losses). As for your other point, yes, I can see how excess reserves may decline as "required" reserves increase. But I still don't think it is correct to say that banks lend out their reserves. Banks make loans by creating deposit liabilities redeemable on demand for currency. I wonder if this is all just semantics? Semantics: Banks don't lend out reserves. They lend against reserves. Something like that. Yes, I think that's right, Art. Except I would extend "reserves" to include additional assets (collateral). Your explanation is in line with the backing theory of money, but you never mention the backing theory (aka the real bills doctrine). Federal Reserve Notes and Federal Funds are liabilities of the Fed, and just like like stocks and bonds, they are valued according to the assets and liabilities of the issuer. So if the quantity of FRN's and/or Fed funds explodes, the Fed's assets normally explode in step. The amount of backing per dollar held by the Fed is normally unchanged, so there is no inflation. Of course, if the Fed's assets fall in value, then there would be less backing per dollar, and we'd get inflation. Good post, David, except for the insult to your old boss. But the problem is not that there is too much base money. The problem is that we pile far too much credit-money atop every dollar of base. The proper way to fight inflation, therefore, is to revise tax law by eliminating some incentives to borrow and replacing them with some incentives that accelerate the repayment of debt. David: Let's start with a very simple model with no commercial banks. Individuals hold Fed currency. They have a desired stock of money, and the difference between the actual and desired stock is excess money. If individuals hold excess money, they will get rid of it by spending it (buying goods) or lending it (buying IOUs). Each individual can get rid of money, but the system as a whole cannot get rid of money, unless the Fed sells something. But their attempts to get rid of it (by spending and lending more) increase the demand for goods and raise prices. And nobody would say "people do not lend money". An individual bank that makes a loan will lose reserves to other banks. Just like an individual person who makes a loan will lose money to other individuals. And when individual banks make loans that does not reduce the total stock of reserves. Just like when individual people make loans that does not reduce the total stock of money. And it makes no difference whether banks make loans in the form of currency or in the form of deposits. In both cases the individual bank will lose reserves to other banks when that loan gets spent and redeposited at another bank. In both cases the borrower (almost certainly) borrowed the money to spend it rather than lend it. In both cases the result is an increased demand for goods, and higher prices. It makes perfect sense to say that banks will lend out excess reserves and the result will be inflationary. You just have to define "excess reserves" in the economically correct (non-US) sense. Standard textbook stuff. 1. Those "excess reserves" (US sense) are not excess reserves currently. 2. If those "excess reserves" (US sense) did become excess reserves, and created an inflation risk, the Fed would do something to eliminate that risk, by eliminating those excess reserves. By either: buying them back; increasing interest on reserves. Damn: typo. I meant to write: "In both cases the borrower (almost certainly) borrowed the money to spend it rather than HOLD it." "By either: buying them back; increasing interest on reserves." In the US there's a 3rd (out of fashion and perhaps "crude") option as well: increasing reserve requirements. Nick, basically, I think you are correct. Especially the part about it not mattering whether banks lend out reserves or not. I think I'll post again on the subject. Thanks for helping to clear things up for me. David, this is a crude way to put the brakes on, but if inflation were to suddenly start getting out of control for some reason, I presume it would still be possible to raise the reserve requirement to eliminate all excess reserves, right? Or at least a good bit of them.... raise it 10% a day if you're worried it will cause problems, and then take a step back when you've gone too far. There's no rule that says that reserve requirements have to be less than 100% are there? In theory, what would it take to eliminate all excess reserves... a reserve requirement of about 170% or so? Tom, yes this can be (and has been) done in the past. Well, John Cochrane says the Fed can always hike IOER. I guess the idea would be that banks earn more on their reserves, and so they then pay more for deposits, and this stifles a rush of people pulling out their cash. I guess if there is a panic of some sort, you have to have a banking holiday. Cochrane even suggests converting the entire national debt into bank reserves. 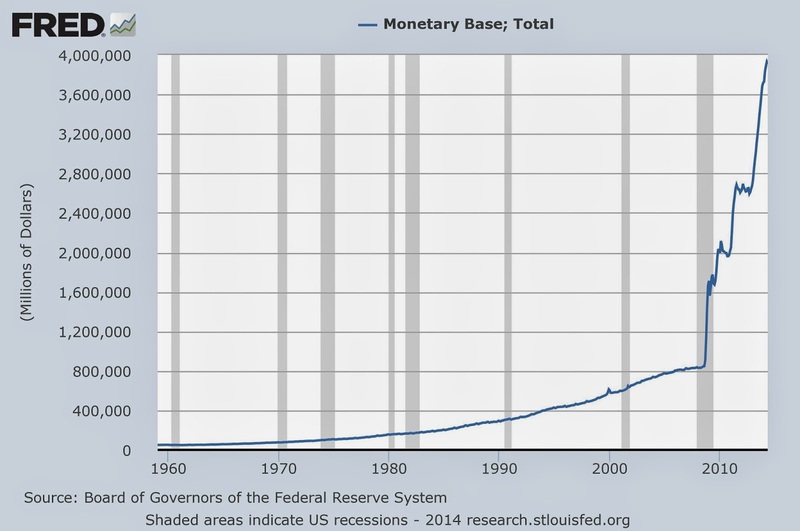 And interest on reserves can be paid by the Fed---by issuing more reserves, or printing money (digitizing money). Cochrane also suggests 100 percent equity-backed commercial banking. No loan that is not 100 percent balanced by bank stock. David, what's your opinion regarding Richad Koo's 'QE Trap' idea? Even though he is emphasizing long-term interest rate hike rather than inflation risk, it is somewhat interesting. He spoke with one person at the Fed (no mention which) and the person seemed a bit clueless, so he discerns that no one at the Fed has thought about exit strategies? Really? If you imagine a black box around both the Federal Government and the Federal Reserve, then to the real world outside this box there is no real difference between excess reserves or government debt. In both cases the black box takes someone's money and pays interest. So like government debt, excess reserves don't cause inflation but they do contribute to the risk of hyperinflation. David, I'm not sure whether you're still attending to this 2014 post, but I'll add a comment anyway. First, I think you hit on the answer to whether or not excess reserves are loaned out when you suggested in one of your last comments that it might be a matter of semantics. Technically, as you explained, excess reserves aren't loaned at all. However, they are sitting there readily available to serve as required reserves in the event that the banking system expands its deposit base by making additional loans, buying securities, etc. It would appear that today the constraint on new lending (and the consequent increase in the deposit base and required reserves) is a capital constraint. Banks don't have the capital required to expand their loan portfolios to anywhere near the ceiling that would be set by today's $2.5 trillion in excess reserves. For all of the excess to be utilized the banking system would have to expand by a factor of 25 or so, I believe, given that the current required reserve level is under $100 billion. That can't happen with today's level of bank capital. However, when there are no excess reserves, as in the not-too-distant past when they ran in the hundreds of millions, and the low hundreds at that, then the level of total reserves can become the chief constraint on banking system expansion, for without the Fed supplying additional reserves, the deposit base can't expand even if the capital base is sufficient to allow a significant expansion. It is at such times that the Fed provision of additional reserves is both expansionary and inflationary, for the bank capital will be there to support the increase in deposits and, if no interest is paid on reserves, banks will freely make loans absent the restriction on total reserves. In the resulting inflationary environment, all values start to increase, loans are larger, the corresponding demand deposits are larger, etc., and over a period of time the entire system is larger, absorbing whatever reserve increase the Fed injected. The system ends up stable at the higher price level eventually, assuming the Fed stops providing additional reserves. Today, I see the situation as a banking system constrained by its capital, possibly due to Dodd Frank in large part (? ), so we are not getting the considerable inflation that the current level of excess reserves would permit. However, to whatever extent the banking system can expand its loan base, it will now be able to do so without any constraint whatsoever from reserve requirements. Essentially, the QE's have disabled the system of fractional reserve banking. We still calculate all the numbers, but reserves no longer constrain the system, nor will they as long as excess reserves are more than frictional (at a level back in the hundreds of millions, as before.) That will also hold true if the Interest on Reserves (IOR) is eventually raised, by the way, as it must be if the Fed is to ever raise rates without somehow draining nearly all of the current $2.5 trillion of excess reserves.